New order processing carts make fast work of order picking at Salon Service Group. A few years back, Salon Service Group was facing the classic growth challenge—at least where its distribution operations were concerned. The company had seen growth of 20 to 25 percent over the past five years, and its small distribution center in Springfield, Mo., was feeling the strain. To ease the pressure, the supplier of hair salon products moved into a new facility in January that was quadruple the size of the previous DC. At the same time, it implemented a new order processing system from FastFetch that incorporates wheeled carts and light-directed picking. Salon Service Group sells hair care supplies to professional stylists throughout the Midwest, serving its clientele through 30 retail stores and a mail-order business. In the old building, workers filled orders for these items one at a time using paper pick tickets and carts. "That building was packed to the gills," recalls the company's vice president, Shane Hanson. "We realized pretty quickly that even with the new building, we would need to add a lot more people if we continued to use our old paper system." After investigating alternatives, Salon Service Group chose the FastFetch order processing system, which allows associates to pick multiple orders at a time. Fifteen cartons are staged onto each of nine wheeled carts, with each carton representing an order. The batch picking capability has led to an enormous improvement in efficiency, the company says. "Being able to pick 15 orders on nine carts means we can do 135 orders within 45 minutes," says Hanson. A tablet computer attached to each cart directs the worker to the first pick location and indicates the total quantity of that stock-keeping unit (SKU) needed to fill all of the orders on the cart. The picker selects the items, then, using a Bluetooth scanner, scans the bar code on one of the items to confirm the right product has been picked. The scan also causes put-lights and quantity indicators on the picking cart to illuminate next to each carton needing that SKU. The worker simply divides the products into the appropriate cartons. FastFetch also allows orders from multiple stylists in the same salon to be packed together in the same carton to save on shipping costs. 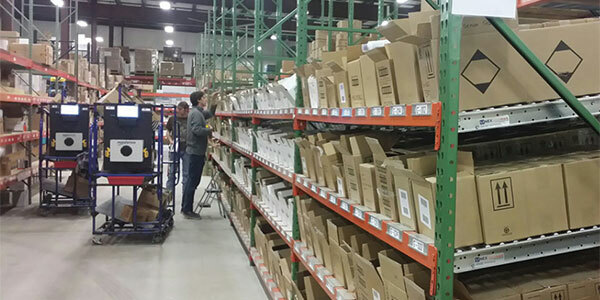 In a separate section of the facility that houses the 80 most popular SKUs, pick-to-light technology is also used. When the cart enters this zone, it breaks a laser beam that causes lights and quantity indicators next to the source SKUs to light up in the racks. A light next to a destination carton will also illuminate on the cart. The worker simply picks the appropriate quantity of the item from the racks and deposits the products into the order carton. In a departure from most pick-to-light systems, the FastFetch hardware incorporates proximity sensors rather than confirmation buttons. The worker simply waves his or her hand next to the sensor on the rack or the cart to confirm the pick. At that point, lights illuminate for the next order and the process continues until all picks from the pick-to-light zone are complete. As for how it's all working out, before implementing FastFetch, the company was able to fill 300 orders a day. Now, it handles an average of 500 orders daily with fewer people and can easily handle peak days of 850 orders. Furthermore, the new system offers the flexibility to grow with the business. Expanding the FastFetch system will be as simple as adding more carts and pick-to-light sections.